Experts in the northwest warn the deadly earthquake in New Zealand was similar to what might happen here. The quake hit Christchurch, New Zealand, a city comparable in size to Spokane, along a fault-line that was unknown until last September. That’s when an even larger quake hit New Zealand — but with limited damage, since it was centered farther from any city. Authorities in Christchurch were predicting the death-toll would rise to 300. In recent years, scientists have found evidence of shallow faults across the northwest, such as the Seattle fault that runs beneath Qwest Field (the Seahawks stadium) and roughly follows Interstate-90. Just like in New Zealand, these shallow faults shake only rarely – perhaps once every 1,000 years, or even once in 10,000 years. Rare, but extremely deadly. In contrast, the most recent major earthquake in western Washington was the Nisqually earthquake. The tenth anniversary happens to be on Monday. 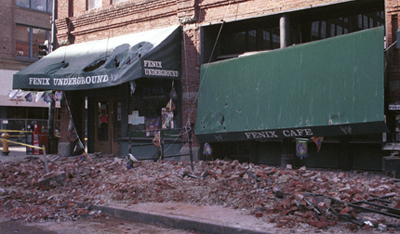 Seattle's Pioneer Square shortly after the 2001 quake. It was bigger in magnitude than the one in New Zealand, but ten times as deep in the ground. The forces people felt in New Zealand were three to four times as strong as the worst shaking from the Nisqually quake, based on preliminary data, Vidale said via e-mail. The University of Washington’s Vince Stricherz has written a nice look-back at the Nisqually quake and a few lessons that have been learned since then. For example, we have better maps of which neighborhoods have the highest risks, and more older buildings have been strengthened. Still, the devastation in a city with modern building codes (as opposed to a city like Port-au-Prince, Haiti) should be sobering in Seattle, Portland, and anywhere in between. “I think [the damage] would probably be worse here [in the Seattle area] than New Zealand, in that we are much more built up, and we have a lot of old structures built before we knew we have big earthquakes here,” says Vidale. Disaster planners like to remind us that some simple preparations can help – such as tying down your water heater, reinforcing your chimney, and making sure you have an emergency kit and a plan. This entry was posted in earthquakes and tagged earthquake by Admin. Bookmark the permalink. I was the Science & Health Reporter for 12 years, and the Environment Reporter for 5 years, at NPR member station KPLU, in Seattle, WA (now re-born as knkx). Today, I've left journalism but keep this blog as a place for writing about some of the topics that I tracked over the years. of gear and supplies that may aid the surviving groups in the battle to live. Do you have prescription medication that you can’t do without for a week. Make sure you understand the rules and regulations of the area especially if there are fire restrictions.